GroupMail makes it easy to move or copy email contacts from one group to another. 4. Click Copy or Move at the bottom of the View and Manage Recipients screen. If you select Copy, then the recipients selected will remain in the source group and a copy of them will be added to another group. 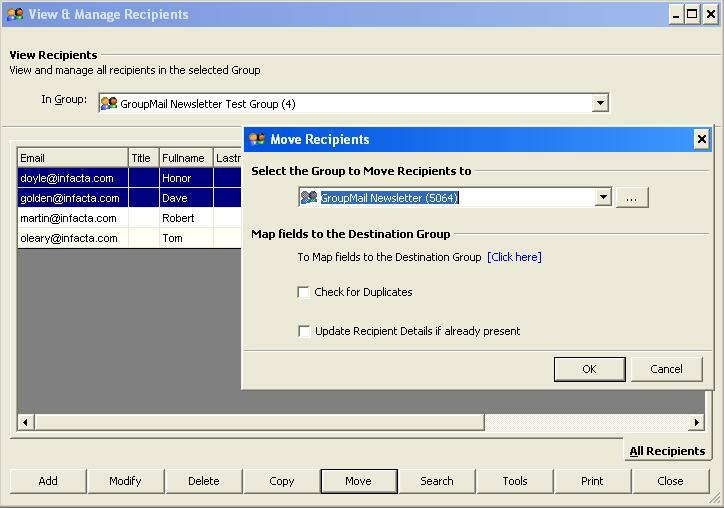 If you select Move, then those recipients will actually be removed from the source group and moved to another group. 5. Select the group you would like to move the recipients to and click OK.
That’s all there is to it folks. Get Moving yourself and download our award-winning GroupMail newsletter software.